Booklet "The Twenty-one Images of Exalted Tara"
We aim to create high quality reproductions of Tibetan Thangka Painting in order to reproduce the dignified presence of blissfull fields of deities of Tibetan Buddhism. 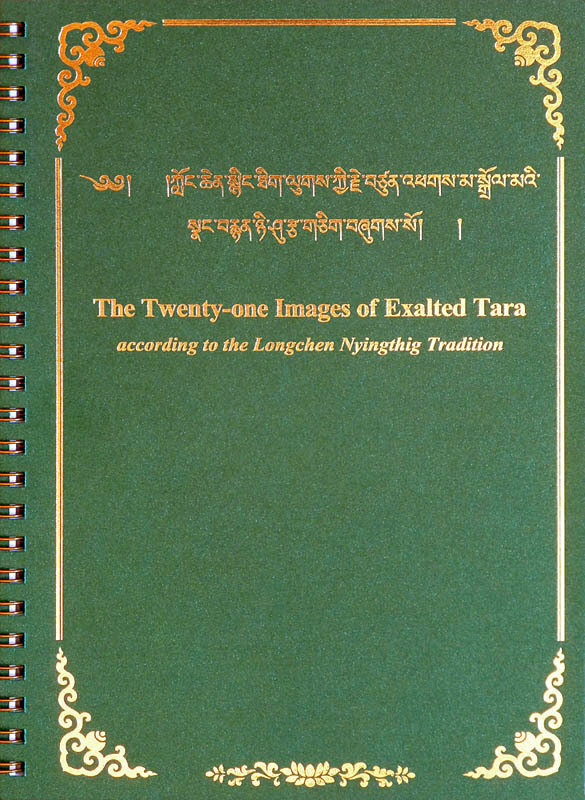 A booklet of "The Twenty-One Praises of Exalted Tara" with the detailed images of the twenty-one Taras. Check more information about the Thangka of the Twenty-one Taras on Yoji's website. Names and images of this booklet are following the "Longchen Nyingthig Tradition"
Note: Actual printed colors may differ due to differences in browser settings and screen resolution. The process of Thangka Painting requires great amount of time. The rich and complex iconography of deities, great details of decorative designs and the smooth gradations achieved by countless delicate strokes or dots. Even though some experienced Thangka painters may have quicker hand than other painters, it is a fact that the more detail, the more it consumes time. While we know that the amount of time doesn't solely determine the quality of the work, creating a good Thangka certainly requires a significant amount of time especially if it is painted with natural pigments. Some of the original Thangkas from which we produce our reproductions are work of hundreds or even thousands of hours. These Thangkas are painted with the belief that not only on the whole but the perfection in every details create the entire perfection. We tried our best to reproduce the richness of the natural colors and every tiny details of these Thangkas as close as originals. Our reproductions are printed on archival heavy cotton paper with a matte finish which is similar to the original Thangka paintings and its smooth surface allows to print the image without losing small details. One of the issues we had was the gold. The real gold is traditionally used on Thangka painting which express the divineness of deities and some of those areas are polished to make it shining. The polished shinny gold appears in dark ocher color in the digital data specially when it was scanned. It can't be helped. That's the fact that the lighting of the scanner was perfectly equal on the entire image. If the gold is shining during the digitalization the data will loose the details around gold. However if the reproductions were to be printed in this condition, it would totally change the impression of original works. We have tried some methods to make it shinny like real gold on our reproductions but unfortunately not to a satisfactory level. Therefore we decided to modify the color of gold on scanned data. We carefully selected the parts painted with gold on the data images and modified to the color close to shining gold after several color proofing. It's a long process and still doesn't give the effect of metallic shine like real gold, however this process made the appearance of reproductions totally different and we are happy with the result. We hope our reproductions will be useful for daily meditation of Buddhist practitioners, arouse interest and open the way to Buddhism for whoever see it thorough this sacred art of Tibetan Buddhism.